Hiking is such a wonderful thing to experience with other people. Having conversation while climbing through the forest, sharing sandwiches on top of a mountain, sweating and working hard with someone in unison; all of those things are important. Being able to reminisce with a hiking partner about that killer hike you did is good for the soul. But, sometimes, solitude is the best medicine. It’s good to be alone, to know yourself, to quiet the voices and incessant chatter. Courage needs solitude. Bravery needs solitude. Hiking alone is also, such a wonderful thing. Maybe there just aren’t friends who enjoy hiking, or maybe you don’t share the same days off. Don’t let that stop you from getting outside and enjoying the wild. I often find myself more nervous in civilization than I am in the woods; a place I feel safe. However, like it or not, as women, it actually can be harder to do things in the world solo. But you should never let that fear stand in the way of having an incredible experience. Plan ahead, be smart and educated, take responsibility for yourself, and hit the trail. I grew up in the mountains, hiking trails behind my dad, learning the ways of the wild. I’ve slept in the middle of nowhere, stood on the summit of countless mountains, had mountaineering training, and come face-to-face with some very odd situations. I feel like I’m a somewhat experienced hiker and I would be comfortable taking care of myself in an emergency. Before you head out on a 10 mile hike solo in the woods, ask yourself some questions. As my own first responder, can I be responsible for myself? Do I own the 10 Essentials of Hiking and do I know how to use each one? Do I really want to hike alone? The last question seems kind of silly, but I think it’s important to always ask ourselves WHY we are doing something. You definitely shouldn’t climb a peak simply because that’s what your sister loves doing, or because you see it on social media, or because you think you should. Look in your heart and decide why it’s important to you to hike, and if that means doing it alone, how do you really feel about that? If it doesn’t settle right with you, don’t do it. Being prepared to hike alone isn’t about fear, but about managing risk. ALWAYS tell someone you trust where you are going and when you expect to be back. If you’re new to hiking, or even new to hiking alone, choose a shorter hike that has recent trip reports from a site like WTA, so you know what to expect ahead of time. Know which plants are poisonous in your area, check weather conditions, know the trail map. If you own a well-trained dog, bring him! Carry a whistle and follow your instincts. Don’t hike with ear buds in (or if you do, leave one out so you can be aware of your surroundings or people coming up behind you). But really-why would you want to cover up the beautiful sounds of nature anyway? It’s easy to let the imagination run wild with ‘what if’s…’ (bears, hail storms, yellow jackets, sprained ankles, oh my)! Calm yourself, hike on, use logic. Visualize yourself hiking alone and succeeding. Paint a mental picture of what it looks like and feels like to do this. Like I said above, it’s easy to let the imagination go rampant with scary scenarios, but sometimes that’s okay! Before you go, think about situations and how you would handle it ahead of time. So if you find yourself lying 15 feet down a ravine with a sprained ankle, you won’t panic (too much). “Okay, I will blow my whistle. I will assess my surroundings. I will check to see if I have cell service…” If you find yourself rounding a switchback to encounter an elusive cougar, you’ll know that running away screaming probably isn’t the course of action you should take. Know that most of the people you meet on the trail are good people. They are out enjoying the wilderness, just like you are. They mean you no harm. That said, be aware of single men or anyone who just gives your gut a weird tingle. Don’t be nice to people who make you feel uncomfortable. Join into a small hiking group coming up or down if you find yourself alone and feeling nervous. As a mom of two young children (3.5 and 1), I understand and appreciate the want to get kids outdoors. We spend a few hours out of the house every day and take our kids hiking a lot! That being said, I’m personally not crazy about taking my little kids hiking alone. Short trails close to home, of course! A long drive and a long hike with elevation gain I want to tackle? No. When my kids are a bit older and less dependent on me for all their needs, I hope we go out together a lot. But I think taking babies or small tots with you still fits into the ‘hiking alone’ category, except now you have more lives to be responsible for other than your own. If you are especially new to hiking alone, do it without the (literal) extra weight, but also the weight of having to worry about someone other than just yourself. Really, to each their own on this one, but being truly alone means having the space to be…truly alone. Take the time for YOU! I also know some women who carry a weapon with them while solo hiking. Without getting into a debate about guns here, that is not my jam. I can’t imagine living my life that defensively. Remember, you’re a smart, strong woman! You have the skills and know-how to plan ahead and get out there on your own. Don’t hike in fear-the world is a glorious, breathtaking place. Through experience comes familiarity and familiarity always breeds confidence. What you gain from being brave and doing something for yourself is huge. Some of your best memories might be those you make alone. Happy, happy trails. Here are some great hikes that aren’t *too far* off the beaten path or down a gazillion logging roads to get you started! If you’re just hiking alone, sometimes driving out to a very primitive area can feel intimidating. Build your confidence with these gorgeous and easily accessible trailheads! Little Si (Snoqualmie; North Bend): I haven’t personally done this hike, but NW Healthy Mama did a recent trip report on this easy hike with simple access right off the road! Close to Seattle and easy driving! Staircase Rapids (Hood Canal): If you want an easy, rambling hike along a river this is the one for you. You can easily tack on more miles by crossing the river and following the trail up the valley. Very low elevation gain. Mount Walker (Hood Canal/Quilcene): You can technically drive this one in the summer, so get up there before the gates open. It’s a definite bun burner with a gorgeous view at the top! 4.5 miles round trip make this one quick, and trailhead access is easy and right off the main highway outside of Quilcene. Multnomah Falls (Columbia Gorge; SW Washington): Climb with the masses to the top of one of the Northwest’s most iconic waterfalls. Access here is SO easy…right off the highway! You won’t get solitude, but if you’re apprehensive about hiking alone, you’ll be sure to have a lot of company up this hike. Cape Disappointment (SW Washington, Long Beach): If it’s open space and sea breezes you seek, this is a perfect hike with a trail that ends at a historic lighthouse! Lake Twenty-two (North Cascades): Aside from this gorgeous hike needing a more fitting name for its beautiful lake, this is a perfect hike to do on your own! Forest, rushing water, alpine lake all in one. Bonus, there’s a bathroom at the trailhead! Skyline Trail Loop: (Mount Rainier area): Save this for a weekday in July or August, when nature is putting on a fantastic wildflower show. This gorgeous hike starts out of the parking lot at Paradise and traverses past glaciers and waterfalls and fields of flowers. You’ll make your way to Panorama Point, where you will be treated to views of the Paradise valley, Mount St. Helens, Mount Adams and maybe even Mount Hood on a perfectly clear day. (note this is in a national park and fees for entrance do apply). 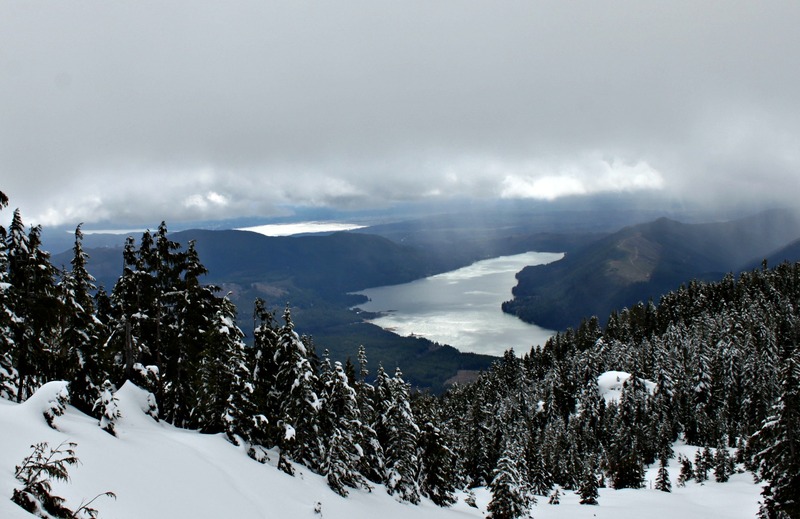 Oyster Dome: This hike is outside of Bellingham, WA and it’s fairly popular. The views are amazing and the trail is gorgeous, too. Wallace Falls: Not too far out of Everett, this hike is a popular one for sure and rightly so! The waterfalls are incredible and the trail is a nice workout, too. 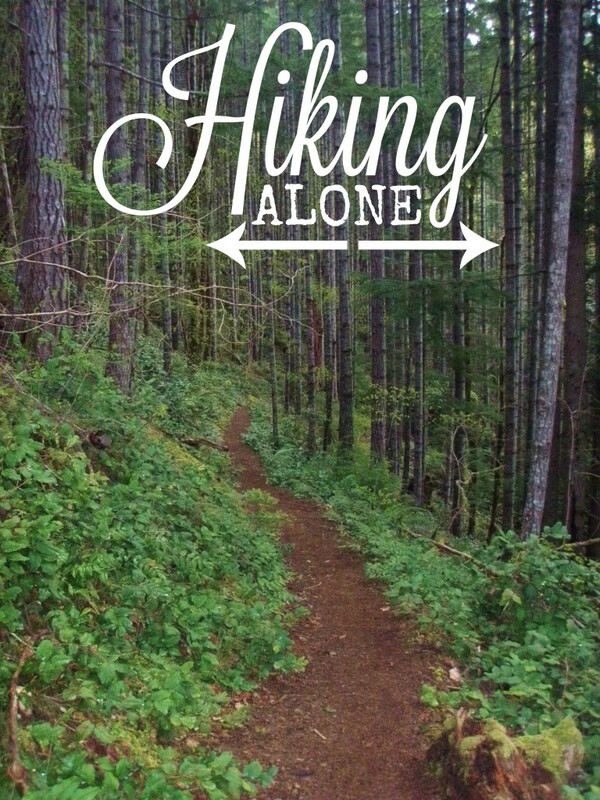 Have you hiked alone? What are some of your favorite spots? What advice would you add to our list? I recommend Cairn an iPhone safety app that makes it easy to notify safety contacts, let them track you for safety, and shows you where to find cell coverage at exact spots in the wilderness. On iTunes. Wow! That is so fantastic! What a great idea. Thank you for sharing, I’m definitely looking into that! You say be aware of single men…Like me who hike alone sometimes for the same reason you do. That I believe is sexist and wrong thinking. I enjoy meeting and talking to everyone, ,mostly, on the trail so PLEASE don’t avoid me. Really enjoyed and appreciated this post. I think a lot of people are afraid in some way to be hiking along, but the benefits definitely outweigh the possibility of something going wrong! Si, Oyster Dome and Wallace Falls are all great starters because there will almost always be other hikers. I’d also add, the best way to ease yourself in is by doing a hike you’ve already done with friends or family. Thanks for sharing! That’s an excellent piece of advice Emma! I would have never thought about that. Knowing a trail you’ve done before would definitely ease the anxiety of the ‘unknown’ for the most part. Thank you for sharing. I love hiking solo! It’s the ultimate recharging of my introvert batteries. It warms my heart to see more and more women hiking along these days. 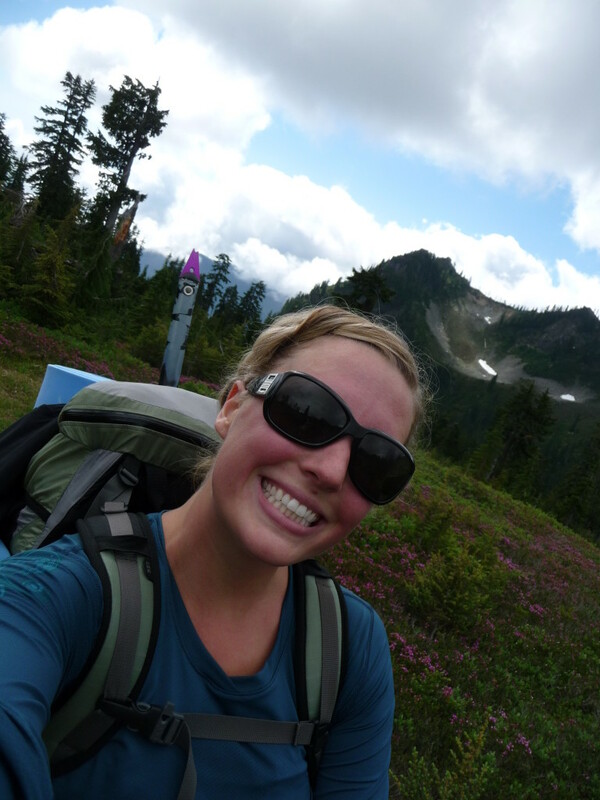 I backpacked solo for a few days on the Wonderland some years ago and several groups of guys were in awe of my being out there alone. “We could NEVER do that!” – more people need to learn that yes, of course you can! I completely relate to the introvert batteries! 🙂 That is completely amazing you did the Wonderland solo! 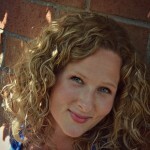 Backpacking overnight alone is a totally different ballgame, maybe you should write a post on it!!! Would love that! As a fairly dedicated solo hiker / wildlife photographer in southern Alberta (though I spent 20+ years in the PNW and return frequently) I thought the article was comprehensive and practical. The thing I have in my standard pack that was not mentioned is bear spray. More specifically it’s carried outside my pack. It’s not only an absolute necessity for bears and other large animals, it’s a visible but subtle advertisement to anyone I meet that I am prepared and capable of protecting myself. It’s handy, it’s effective, it’s non-lethal and it works. On wildlife with 4 legs or 2. I love this! I too, carry spray with me. I’d love to see some of your wildlife photography! Do you have a website? Thanks for posting this. Solid, practical advice. I started hiking alone in the last year, and it was pretty unnerving at first. Like another commenter said, I do hang my bear spray where it can be seen, along with a bright orange whistle that can be heard for miles. Not that I expect trouble on the trail, but there’s no harm in looking like a harder target, either. I used to be of mixed opinion what to do when coming across a lone man. Part of me wanted to essentially pretend to be invisible in the hopes I’d be left alone, but I did wonder if coming across as confident (looking them in the eye and saying hello like I would for a woman) also makes you seem like the kind of woman who would have no problem fighting back if accosted. But now that I’ve been hiking solo for a while, I find myself saying hi to everyone who doesn’t creep me out. Love solo hiking and backpacking. I enjoyed your article and pointers. Please add GPS locater to your list of what to bring as these are awesome if there is no cell service, especially in case of emergency. There is also a button to do a ‘check in’ (‘Spot’ GPS has this capability) and a little pre-entered personal note(‘checking in, all is ok’, or whatever note you decide) shows up on text and email, with latitude/longitude. Get out there and enjoy!